HÀ NỘI — Thang Long Warriors proved the strongest team of the Việt Nam Basketball Association League with another win over Saigon Heat here yesterday. 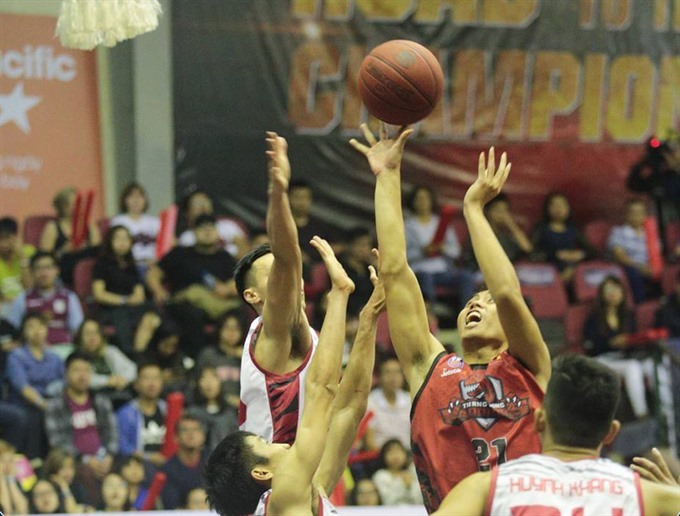 The league leader secured 69-66 against the Heat, who are the first professional club in the country and have taken part in the ASEAN Basketball League for six seasons. It was the host’s second win over their rivals within a week. In this season, the Warriors, the new face of the league, have won two and lost one to the Heat. In yesterday’s game, the Warriors did not have a good start: They lost the first quarter 9-15. The result was even larger in the second quarter, at 36-24 for the Heat. The score was 56-45 for the visitors after the third quarter. However, the Warriors came back in the fourth game when they scored points consecutively. They narrowed the result at 58-59 and went on to beat the Heat 69-66. In a match on Saturday, Hanoi Buffaloes beat Danang Dragons 83-61. After the qualification match, the Warriors topped the ranking with 12 wins. The Heat were second, followed by Cantho Catfish and the Buffaloes.